Between them, high interest rates and tariffs are affecting the readings in all three timeframes. As usual, clicking on the link and reading the post puts a little coin in my pocket, as well as giving you an up-to-today read on the economy. While existing home sales are roughly 90% of the entire housing market, they are much less important as an economic indicator because they do not have the knock-on effects of construction improvements, and less of the landscaping and indoor improvements, that new homes do. But they certainly do help us track the trend. And like housing permits and starts, and new home sales, the trend has not been good this year. In September, existing home sales were at a 5.15 million annualized trend, down for the sixth month in a row, down YoY, and close to a 3 year low. Further, existing home sales have not made a new monthly high since last November, 10 months ago. The 3 month average has not made a meaningful new high since April of last year. If there was a silver lining in this report, it was that the YoY increase in the median price of an existing home, at 4.2%, while still outpacing wage and household income growth, decelerated from last month's 4.6% level, and was well below the 5%+ YoY readings from earlier this year Because prices have pronounced seasonality, the YoY metric is the only way to track them. My typical workaround, that if the increase declines by more than 1/2, then the top has probably been set, is valid for this number, but of course we would need to fall below a 3% YoY increase for that to kick in. Inventory is now increasing, and I expect that to last until sales decline enough to drag prices down with them. Bottom line: this is another negative report from the housing sector. 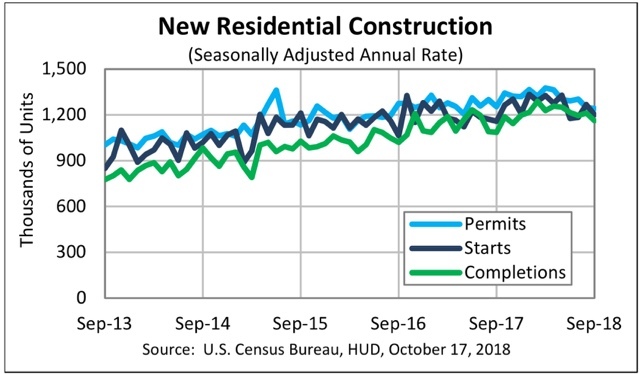 We still have September new home sales and Q3 fixed residential spending to be reported next week for the picture to be complete. Let me start out by saying that there is an excellent case for the US imposing a VAT ("value added tax") similar to those enacted by Canada and European countries in order to recapture the losses due to far lower wages in China and other developing countries. Additionally there is an excellent national security rationale for not entering into"free trade" agreements with authoritarian governments who will use the benefits to build up their militaries. Not that this is what Trump is doing, of course. 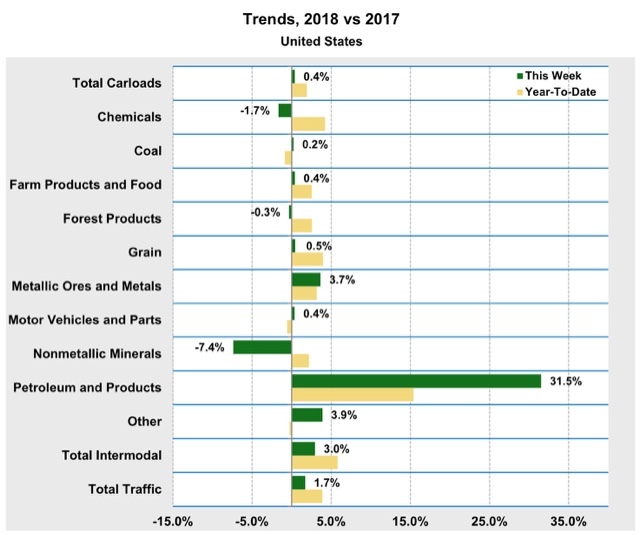 In any event, I've already noted that the weekly rail report by the AAR seems like an excellent way to track the impact of Trump's tariffs, especially via intermodal units which are used for ocean shipping. 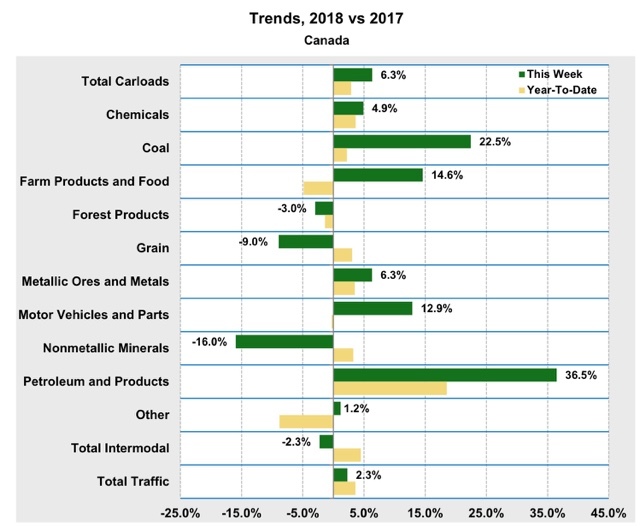 This week I happened on another excellent usage: comparing US vs. Canadian real loads, both of which are monitored weekly by the Association of American Railroads. Note that carloads, especially of various agricultural products, were reasonably comparable in the two countries. 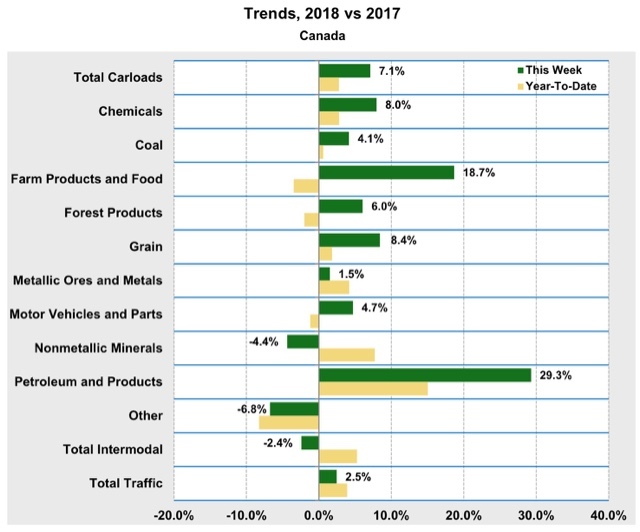 With the exception of forest products and grain, YTD comparisons are still positive in Canada. But look at what has happened in the US. All of the YTD and YoY weekly comparisons have collapsed, and the latter have turned completely flat or negative. 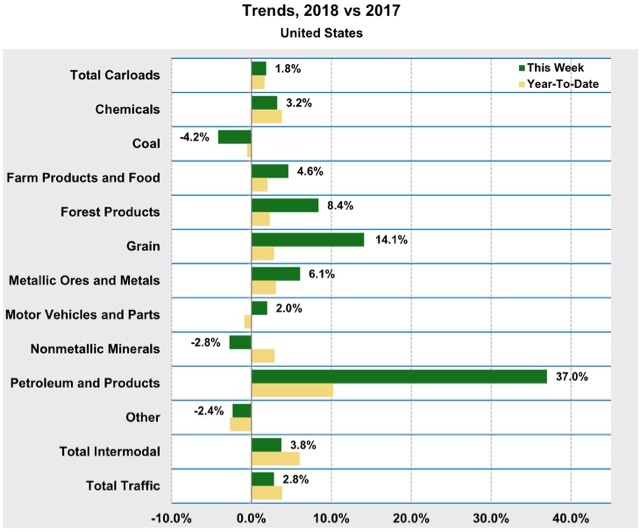 This is incontrovertible evidence that Trump's tariffs are hitting US agriculture - and transportation - hard. Job openings, quits, and hires have all surged higher this year, with openings virtually "on fire." . In the 2000s business cycle, hiring and then firing both turned down well in advance of the recession. Both are still advancing. The YoY% rate of growth had been decelerating, but has accelerated again. As I noted when I first presented this graph, while the rate of job openings is at an all time high, the rate of actual hires has only just reached its normal rate during the several best years of the last, relatively anemic, expansion, and is below its rate at the end of the 1990s expansion. Meanwhile quits are just below their best level of 2001 (at the end of the tech boom). that the *rate* of actual hiring is below that of the anemic Bush expansion is very telling. My take is that employees have reacted to the employer taboo against raising wages by quitting at high rates to seek better jobs elsewhere. In summary, the August JOLTS report shows an employment market that is moving past thriving to downright hot, but a market that continues to reflect a failure of wage equilibrium, My expectation is that this will last a few more months, and then start to cool down early next year as a slowdown begins to take hold. My take on the Industrial Production report yesterday, and my extended take on the housing permits and starts report this morning, are both up at Seeking Alpha. You can click on the respective links to access them. In each case, the YoY comparisons are getting more challenging. In the case of industrial production, it means a downshift in outsized gains. In the case of housing, it means numbers that are barely ahead of, or even worse than, one year ago. Single family permits did improve month over month are are up +2.4% above last September's easy comparison, but are still about 3.5% below their February peak, and tied with March for the 3rd worst reading in the past 12 months. Total permits came in at yet another 12 month low, are down -1% YoY, and down -10% from their March high. This is recession watch territory. Housing starts were higher YoY by +3.7% against an easy comparison, but were lower than every other month since except June and July, and are -9% off their March peak. I am maintaining my negative reading for these numbers. If this is confirmed by new home sales and real private residential fixed investment next week, housing as a whole will be in firm negative territory. So I am reading some caterwauling in the progressive blogosphere about how the midterm polling has tightened and "the wave may have crested too early." .... The results of last June's special election in Georgia, in which GOPer Karen Handel defeated Democrat Jon Ossoff show that there is a roadmap to the GOP minimizing their losses in this November's midterms. Because while all of the legislative elections in 2017 and so far in 2018 have featured huge gains in Democratic turnout, the difference in Georgia was that there was a *similar* spike in GOP turnout. And this playbook is going to be easier for the GOP to run in nationwide contests than in local special elections. [In the Georgia special election, w]hile there was sky-high Democratic turnout, turnout by GOPers was almost as high -- enough so that their candidate prevailed. In other words, when both D's and R's turn out at near-Presidential levels, the outcome resembles that of the district's vote in the last Presidential election. In November, it is going to be much easier for the GOP and their propaganda organs like Fox to "nationalize" local elections, arguing that a Democratic House is likely to impeach Trump (true) and veto new regulations on, e.g., Muslim and Latino immigratiion proposed by Trump's bureaucracy (true), while a Democratic Senate will refuse to confirm Trump's anti-gay and anti-abortion Judicial nominations, including any vacancies that may open up on the Supreme Court (also true). If so, the vote in Congressional districts and Senate races is likely to come closer to mirroring that from 2016. So, here we are in October, and GOP voters are "coming home" in part based on a "vacancy that [ ] open[ed] up on the Supreme Court." Surprise, surprise. But Trump is probably going to create a bunch of new controversies dominating the news cycles over the next three weeks, so Kavanaugh is going to be something of a distant memory. Get over your caterwauling and get out and vote. Real retail sales is among my favorite economic indicators. Measured per capita, it is a long leading indicator for the economy as a whole, while its simple measure is a short leading indicator for employment. Last week I noted that retail sales had grown nominally by +1.9% last September, likely a rebound from last year's troika of major hurricanes, including the one that dumped up to 50" of rain on parts of metro Houston. While this year Florence was bad, it did not shut down major metro areas, so I anticipated the YoY number would suffer in comparison. Real retail sales have grown by +2.4% over the last 12 months. The quarterly change has not been problematic unless it is negative for two consecutive periods. Since with the exception in Q1 this year it has been positive, there is no negative signal yet. On the other hand, if the weakness of the last two months persists further, and if housing continues to turn south, that would be a potent sign that the consumption side of the economy is under pressure, and be yet another harbinger of a slowdown that I have suggested is likely by about midyear 2019. The long-term rise of Japanese militarism that culminated in the Pacific War in World War 2 was painstakingly documented in Meirion and Susie Harries' excellent "Soldiers of the Sun," a template that ought to give pause to Americans today. Briefly, the Meigi consitution required that there be a military cabinet secretary. If that secretary resigned, the government fell. Once the military realized the leverage they had, they used it repeatedly and for ever larger reasons, until they controlled the government. They used it as militaries tend to do, seeing "poor little Japan" beset by enemies on all sides. But vanquishing one enemy simply moved the border. There was always a border, and there was always a nervous and potentially hostile state on the other side of it. The sequence kept playing out until finally there was a sleeping giant on the other side of the border, a giant who was awakened, and then angrily squashed them like bugs. But no comparable historical account has apparently been done with regard to the similar ascent of the German military. In fact, the received wisdom is on the order of, "How could such a refined culture that gave rise to Goethe, Bach, and Beethoven have turned into a military totalitarian state?" As it turns out, the ascent was gradual but inexorable result of a system built on a military version of the Hastert rule. A great book is out there, I suspect, but since it isn't let me give my poor attempt at a sketch. What brings me to this conclusion is a little-known (at least to probably 99% of Americans) event during World War 1. When I was a schoolboy, Europe disappeared from the textbooks between 1783 and 1914, with the exception of a brief cameo appearance explaining that England's impressment of American sailors was a cause of the War of 1812. In the past few years, I've read a number of histories to fill in that gap. In the 19th Century and up until 1914, when European civilization was at the absolute apogee of its power, something like 25% (my rough guess) of its total population emigrated, almost all of it to the US. That's a breathtaking statistic. But consider that in 1914, the technologically modern European society of railroads, subways, telephones, telegraphs, photography, electricity and lighting, and even the beginnings of cars, planes, radio, and movies, was controlled politically by heredity monarchs and their supporting hereditary aristocracies. Only France and Britain were the exceptions (and even in Britain, despite Parliamentary ascendancy, the aristocratic power structure still existed in large part). By contrast the United States really was a breath of fresh air. And for the next 30 years, that aristocratic European civilization all but destroyed itself as statecraft utterly failed in the most thoroughgoing and comprehensive way. For all of the talk of entangling alliances, the outbreak of World War 1 can be traced to the personal failures of two monarchs: Kaiser Wilhelm and Tsar Nicholas. Wilhelm, as I've previously written, was a virtual doppelgänger for Donald Trump. He could have had the alliance he craved with the United Kingdom had he not indulged in his colossal vanity project of building up the German Navy to no useful end. Tsar Nicholas, meanwhile, was a virtual twin of his cousin King George VI of England - a private, hidebound, middlebrow family man with no talent for actual governing. Unfortunately, unlike George, in his case it actually mattered. Both Nicholas and Wilhelm had the same fundamental failing of being unable to oversee their militaries. Thus in both cases in 1914 the militaries had one and only one scheme for mobilization. In the case of Russia, Nicholas only wanted to mobilize against Austria-Hungary, but was faced with the fact that Russia's only mobilization plan - which he had never paid attention to before - had an inextricable part of mobilizing against Germany. Germany's sole plan, in turn - which Wilhelm had never paid attention to before - necessarily included a first strike against France through neutral Belgium. A previous plan that called for defense in the West while attention was focused on Russia, had been shelved and was no longer available to him. And the rest, as they say, is history. Even so, a competent monarch with able diplomats might have seen that once Germany's "Schlieffen" plan to take out France failed in 1914, it was unlikely to win a two-front war of attrition. But with the temporary advantage of having conquered a large amount of territory, it could have traded Belgium and most of its conquest in northern France (or held small parts hostage) in return for a separate peace with Britain and France. Even an incompetent monarch who at least had some judgment for talent might have seen that his oldest son, Crown Prince Wilhelm, was an able commander and shrewd observer of the military, and deferred to him or even abdicated so that disaster could have been averted. But what did happen, and the event that I did not know of previously, and that brings me back to the title of this post, is that the Kaiser became a virtual puppet of his own military, and was all but displaced in a military coup in 1917. That's right. The absolute ruler of Germany, during the last 18 months of World War 1, was no longer in control, displaced by a du-umvirate of Generals Hindenberg and Ludendorff. How could that come to pass? The answer, it seems, as a alluded to in my opening paragraph, was a military version of the Hastert rule. It starts with the historical truth that East Prussia begat Prussia, which begat West Prussia, which begat northern Germany, which begat Imperial Germany at the conclusion of the Franco-Prussian War. Each stage of expansion was a result of military conquest and assimilation. And at each stage the original landowner and military caste of East Prussia, the Junkers, maintained effective control -- much as the military caste did in Japan after the Meiji Restoration. Thus, even after 1870, Prussia was first among equals in the new German state, and the Junker Generals were the Kaiser's power base in Prussia. The civil government in the new Reichstag had no power whatsoever over the military. That was vested entirely in the Kaiser. For his entire reign spanning over 30 years, Kaiser Wilhelm lionized the military. They were held up as the epitome of the German state. All the military did was take Wilhelm at his word. When the incompetent, narcissistic Wilhelm ceded control of strategy to the military Chiefs of Staff in 1914, with no ability for civil oversight, the military simply treated him like the proverbial mushroom, keeping him in the dark and feeding him, um, only trivial good news. Thus, for example, Wilhelm was never told about Germany's huge offensive around Verdun, France in 1916 in advance. He only learned of it in the newspapers. As the war of attrition - greatly aided by Britain's successful naval blockade - worsened, Germany's military needed more and more of society's resources to be fed into it. The civil government had no real authority to act, and the feckless Wilhelm was, well, feckless. So the military commanders - the early war heroes Hindenberg and even moreso his lieutenant Ludendoff - took matters into their own hands, simply brushing Wilhelm aside. They threatened to resign unless Wilhelm gave them their way. Wilhelm blinked. Ultimately, according to one account, Hindenberg took for himself the Kaiser's title of "Supreme Warlord." Ludendoff apparently confessed to Crown Prince Wilhelm that he didn't actually want the power, but nobody else was acting, so he had to himself. Once Germany's military had de facto full control, all avenues of diplomacy that may have existed evaporated. First the military was sure that the War in the West would be over before America could enter it in response to unrestricted submarine warfare. Then they were sure that no American troops would ever land in Europe. Then Ludendorff was sure that a spring 1918 offensive would win the war before there were enough American troops in Europe to make a difference. Then Germany's reserves were exhausted and the remaining French, British, Canadian, and Anzac forces - together with a million new American troops - simply rolled them back for 100 days before the military had the civil government agree to an armistice on any terms (thus seeding the "stabbed in the back" fallacy - that Ludendorff himself became a vigorous proponent of - which came back to haunt Europe). So overwheleming were the number of American troops that one of the reasons Clemenccau and Lloyd George agreed to the armistice quickly before reaching German soil was to prevent the detested Woodrow Wilson from dictating the terms of peace. So, German militarism did not suddenly appear in 1934. It had been there all along, growing in stages as Prussia did over the course of at least two centuries, taking over more and more territory as the German imperial state was assembled. And now we are in 2018 America, where the deification of the military - in reaction against the Vietnam war dissidence - has grown apace at for the last 30 years. It has reached the point where none dared oppose Trump's completely unsolicited and unsupported $300 Billion increase to the military budget this year. Once the military realizes that it has a de facto veto power over the US's budget, what happens next? It seems there is a template.